Abdel Aziz Al-Chami from Aleppo is the man of the Al-Chami household. He works, educates himself, manages all family affairs and handles all family communication. This sounds quite normal until you learn he does not do this by choice and Abdel Aziz is just 10 years old. Both Abdel Aziz’s parents, father Abdulhay and mother Haddad, are deaf and dumb and have been so all their lives. They are both very loving parents but their disability means young Abdel Aziz has had to grow up fast. They communicate with Abdel Aziz through sign language, which he remarkably picked up by just watching them communicate with each other. At the time the war broke out, they were living with their family in Homs. They had to leave in December 2011 as the violence in the city showed no signs of abating. They decided to escape to Lebanon and, despite having Lebanese documentation, the trip to Lebanon would not prove straightforward. Being unable to communicate whilst fleeing a war is an already pressurised situation. This becomes even more pressurised when, preparing to cross the Syrian-Lebanese border, you realise you have left all documentation in Homs. Having left under such conditions, turning back was not an option. The missing documentation delayed their escape and caused consternation. They feared being forced to return to their war-torn city and the inevitable fate that would await them there. However, young Abdel Aziz stepped up and returning to Syria was not to be. His communication skills helped explain that his mother had Lebanese residency and they were allowed cross the border. They made their way to Tripoli in the north of Lebanon. And like that their lives changed dramatically and forever. They were forced out of their home, into a foreign land with no independent means of communication. They settled in the Abu Samra part of the city, where many other Syrian refugees live. Despite being in the company of so many of their fellow countrymen and women, they are alone. They have no relatives here and they receive only minimal support from the UN and other such agencies. In Syria, Haddad had her own hairdressing business and Abdulhay owned a number of small metal workshops. They had a very comfortable lifestyle yet now they have a much lower standard of living and they are very much in the hands of their 10-year old son. Life is totally different for the Al-Chami family here and extremely difficult. They fled war in their home country and were forced to live in a foreign land with no ability to communicate. Abdel Aziz handles all of their communication with local authorities, schools and employers. So much responsibility for such young shoulders. He communicates with his parents through the sign language he learned from them and his parents stay mainly at home while he goes out looking for work. As deaf and dumb refugees they do not have many opportunities to work or express how they feel. They want to leave Lebanon so they can find a safe and decent place to live, however, that does not look likely at this stage. Neither parent is allowed work and they receive no support from the UN or Lebanese authorities as deaf and dumb refugees. To survive, they do odd jobs every now and then and live off their dwindling savings from Syria. Abdulhay occasionally works as a janitor while Haddad does casual work for her neighbours. As deaf and dumb refugees, they are forced to accept the worst working conditions and pay. Before going to school in the morning and after returning in the evening, it is Abdel Aziz who regularly goes to work. He works in local shops, does cleaning jobs and delivers newspapers. He does not arrive home until very late. His education is suffering and both his parents and teachers are worried, but they must do what they can to survive until they can find a better alternative. At present, there is no better alternative as returning home is not safe and moving to another country is not possible. Until all that changes, it is young Abdel Aziz who is carrying a lot of the responsibility as the young man of the house. Yet it is unclear for how much longer such a young boy can remain a young man. 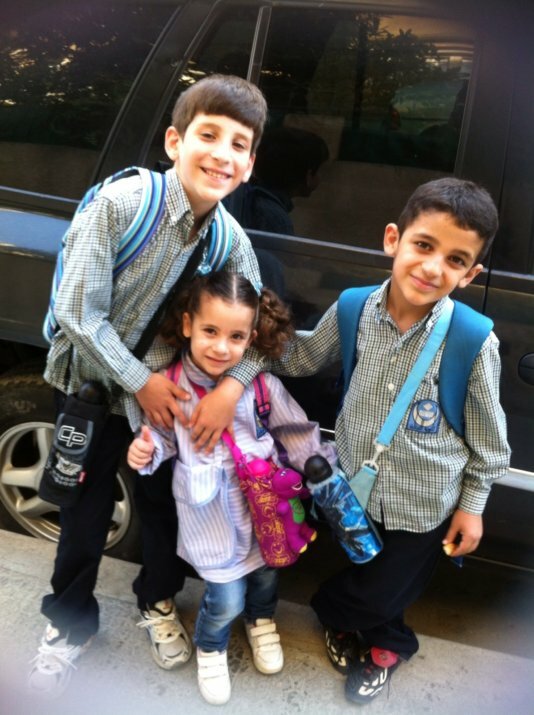 Abdel Aziz Al-Chami and his siblings. He communicates with his parents through the sign language he learned from them and his parents stay mainly at home while he goes out looking for work. As deaf and dumb refugees they do not have many opportunities to work or express how they feel.